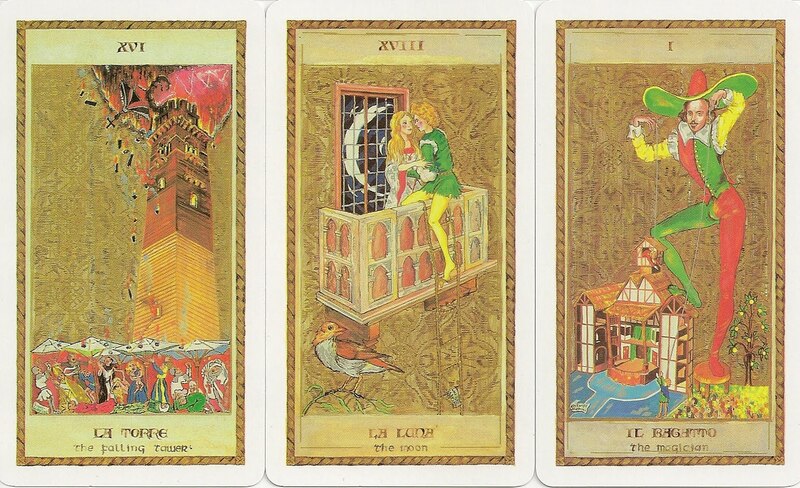 Although the title of the deck is the Tarot of Romeo and Juliet (Tarocchi di Guiletta e Romeo) the scenes on the cards are from all the works of Shakespeare. The background of the Major Arcana and the back design are gold-figured, in reference to the Renaissance cards of Northern Italy. Titles on the cards are in Italian and English. The 2002 edition is smaller-sized (relatively speaking) . In fact, the deck is about the size of a standard Waite-Smith deck... but clearly smaller than the 1990 "deluxe" edition. The deck is also known as the Shakespeare Tarot.